No sooner had Israel launched Operation Protective Edge to stop the sustained rocket and missile attacks on its civilian population by the Gaza-based Hamas terror organization than it came under a barrage of international criticism, with tens of thousands of violent demonstrators flocking into the streets of London, Paris, Berlin, Oslo, Sydney, Buenos Aires and New York, among other places, to demand an end to the "Gaza slaughter." How can this be? Why do citizens of democratic societies enthusiastically embrace one of the world's most murderous Islamist terror organizations, overtly committed not only to the destruction of a sovereign democracy but also to the subordination of Western values and ways of life to a worldwide Islamic caliphate (or umma)? 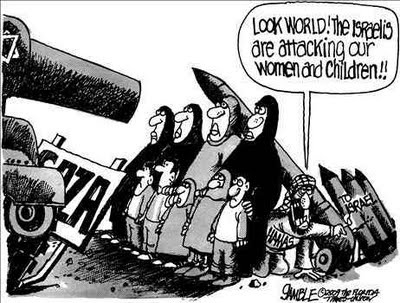 Not out of a genuine concern for Palestinian wellbeing. For although the "Palestine question" has received extraordinary media coverage for decades to the exclusion of far worse humanitarian and political problems, the truth is that no one really cares about the fate of the Palestinians: not their leaders, who have immersed their hapless constituents in disastrous conflicts rather than seize the numerous opportunities for statehood since the Peel Commission report of 1937; not the Arab states, which have brazenly manipulated the Palestinian cause to their self-serving ends; and not Western politicians, the media, NGOs, human rights activists, and church leaders enticed into self-righteous indignation by any Israeli act of self-defense. Had the Palestinians' dispute been with an Arab, Muslim, or any other non-Jewish adversary, it would have attracted a fraction of the interest that it presently does. No one in the international community pays any attention to the ongoing abuse of Palestinians across the Arab world from Saudi Arabia to Lebanon, which deprives its 500,000-strong Palestinian population of the most basic human rights from property ownership, to employment in numerous professions, to free movement. Nor has there been any international outcry when Arab countries have expelled and/or massacred their Palestinian populations on a grand scale. The fact that the thoroughly westernized King Hussein of Jordan killed more Palestinians in the course of a single month than Israel had in decades was never held against him or dented his widely held perception as a man of peace. As the supposedly pro-Palestinian journalist Robert Fisk put it in his memoirs, King Hussein was "often difficult to fault." Kuwait's 1991 slaughter of thousands of innocent Palestinians who lived and worked in the emirate (and the expulsion of most of its 400,000-strong Palestinian population) passed virtually unnoticed by the international media, as has the murder of thousands of Palestinians in the ongoing Syrian civil war and the reduction of countless others to destitution and starvation. By contrast, any Palestinian or Arab casualty inflicted by Israel comes under immediate international criticism. Take the blanket media coverage of Israel's military response in Lebanon (2006) and Gaza (2008- 09, 2012) but not of the original Hezbollah and Hamas attacks triggering it, in stark contrast to the utter indifference to bloodier conflicts going on around the world at the same time. On July 19, 2006, for example, 5,000 Ethiopian troops invaded Somalia in what it claimed was an action to "crush" an Islamist threat to its neighbor's government. A month later, Sri Lankan artillery has pounded territory held by the rebel Tamil Tigers resulting in mass displacement and over 500 deaths, including an estimated 50 children following the Sri Lankan air force's bombing of an orphanage. But neither of these events gained any media coverage, let alone emergency sessions of the UN Security Council, just as the bloodbath in Iraq at the time, with its estimated 3,000 deaths a month at the hands of Islamist militants sank into oblivion while the world focused on Lebanon, just as the current slaughter in Syria and Iraq is presently ignored. And what about the-then long-running genocide in Darfur, with its estimated 300,000 dead and at least 2.5 million refugees? Or the war in the Congo, with over four million dead or driven from their homes, or in Chechnya where an estimated 150,000- 160,000 have died and up to a third of the population has been displaced, at the hands of the Russian military? None of these tragedies saw the worldwide mass demonstrations as has been the case during the Lebanon and Gaza crises. Nor should we forget that Hezbollah has been implicated in dozens of international terror attacks from Brussels to Buenos Aires. Indeed, the response to its July 18, 1994, terror attack on the Israeli- Argentine Mutual Association (AMIA), a social center catering for Buenos Aires' large Jewish population, provides an illuminating contrast to the relentless coverage of the 2006 events in Lebanon. It was the worst terror attack in Argentina's history, killing 100 people and wounding more than 200. More died in this bombing than in any single action in the 2006 Lebanese war. Yet the BBC, which prides itself on the worldwide coverage, didn't find the atrocity worth mentioning in its evening news bulletin. When confronted with a complaint by the normally timid Board of Deputies, British Jewry's umbrella organization, the corporation offered an apology of sorts, blaming the omission on a particularly busy day. What were those daily events that could have possibly diverted the BBC's attention from the Argentina massacre? A perusal of the papers reveals the British premier of Steven Spielberg's new film, The Flintstones, attended by the prince of Wales. This was also the day when Gavin Sheerard- Smith, caned and imprisoned for six months in Qatar after being convicted of buying and selling alcohol, returned to Britain professing his innocence, and when David MacGregor, an agoraphobia sufferer jailed for a fortnight for failing to pay poll tax arrears, had his sentenced quashed. An eventful day indeed. Given the BBC's indifference to the massacre of Argentinean Jews by Hezbollah, it is hardly surprising that the corporation, along with much of the world's media, ignored the almost daily rocket attacks by the same group on Israel's northern border, not to mention the constant outpouring of rockets and missiles from Gaza since the Israeli withdrawal from the territory in 2005. And why shouldn't they? The killing of Jews and the destruction or seizure of their worldly properties is hardly news. For millennia Jewish blood has been cheap, if not costless, throughout the Christian and Muslim worlds where the Jew became the epitome of powerlessness, a perpetual punching bag and a scapegoat for whatever ills befell society. There is no reason, therefore, why Israel shouldn't follow in the footsteps of these past generations, avoid antagonizing its Arab neighbors and exercise restraint whenever attacked. But no, instead of knowing its place, the insolent Jewish state has forfeited this historic role by exacting a price for Jewish blood and beating the bullies who had hitherto been able to torment the Jews with impunity. This dramatic reversal of history cannot but be immoral and unacceptable. Hence the global community outrage and hence the world's media provision of unlimited resources to cover every minute detail of Israel's "disproportionate" response, but none of the suffering and devastation on the Israeli side. A profoundly depressing state of affairs indeed. But so long as the Palestinians continue to serve as the latest lightning rod against the Jews, their supposed victimization reaffirming the latter's millenarian demonization, Israel will never be allowed to defend itself without incurring the charge of "disproportionate force" – never directed against any other besieged democracy but evocative of the classic anti-Semitic stereotype of Jews as both domineering and wretched, both helpless and bloodthirsty. In the words of the renowned American writer David Mamet, "The world was told Jews used this blood in the performance of religious ceremonies. Now, it seems, Jews do not require the blood for baking purposes, they merely delight to spill it on the ground."